Unlock old memories by browsing the music of your past. 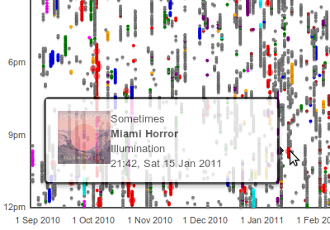 Visualise your entire listening history, in one graph. Sgt. Pepper's Lonely Hearts Club Band for the first time? Party Rock Anthem on repeat for three hours straight? The Rolling Stones for the first time? Life changes often precipitate changes in listening habits - your listening history can give insight into your life history. Is your story reflected in your songs? out at the beach at Christmas?